December construction spending report was weak. But probably not the reason stocks fell. Stocks entered the week very overbought. No matter if economic reports beat or missed estimates, stocks would be on a path lower. Construction spending report showed monthly growth was -0.6% which missed estimates for 0.3% growth and November’s 0.8% growth. This report was below the lowest estimate which was for -0.3% growth. Year over year growth was a putrid 1.6% as it fell from 3.4% in November. As you can see in the chart below, that was the weakest yearly growth in at least 3 years. Private residential construction was the culprit of this weak report as housing was terrible in December. Private residential construction was down 1.4%. There was a 3.2% decline in spending on new homes and a 3.1% increase in spending on multi-family homes. Spending per unit on multi-family homes is much less than single family homes. Spending on remodeling fell by 0.4%. The good news is private non-residential construction spending was up 0.4%. It was helped by a 3.3% increase in healthcare construction spending, a 1.7% increase in manufacturing spending, and a 1% increase in lodging. 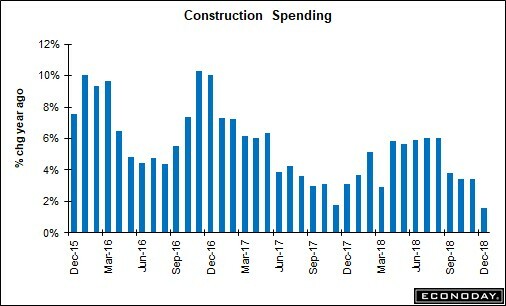 Public construction spending was also weak as it was down 0.6%. Healthcare spending was down 7.8%, residential spending was down 5.1%, power was down 2.9%, and highway & street construction was down 0.9%. Those were partially offset by increases in office construction and commercial construction of 6.4% and 6.1%. Many expected ISM and Markit services indexes would be stronger than their manufacturing counterparts because of the flash Markit reading. Those correct expectations didn’t lead to a financial gain because stocks fell on Tuesday. The only thing the great services PMIs did was give the bulls ammo in their debate with the bears.